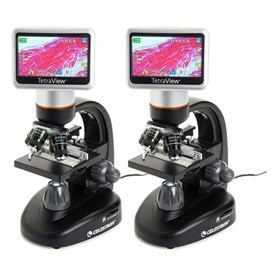 The Celestron 44347 is a TetraView LCD digital microscope which features a 5MP digital camera, achromatic objectives on a rotating turret, a 180° rotating TFT LCD display, and cordless operation option. The built-in 5MP digital camera delivers up to 400x on-screen magnification without digital zoom. With the 4x digital zoom, it delivers total magnification of up to 1600x. You can view your specimens via an integrated 4.3" display, capture images and videos, or save them to external memory. The 44347 features an AV/TV and USB output ports which enable you or your audience to view images or videos on a larger screen. It has an SD card slot which supports up to 32GB of memory. To provide lighting for your slides, there is a bottom LED illuminator with controllable brightness and 0.65 NA condenser for collimating a light cone. The Celestron 44347 2-Pack has many exciting features for users of all types. You can extend the lifetime of your Celestron 44347 2-Pack with the purchase of a FactoryOutletStore Factory Protection Plan. See the Celestron 44347 2-Pack product video and gallery images above for more details. The Celestron 44347 2-Pack is sold as a Brand New Unopened Item.